Honest Chocolate have opened on Wale Street, No 66 to be exact. Same side as the Taj, and up the hill. Michael De Klerk and Anthony Gird are the two guys behind Honest Chocolate. This is the most delicious chocolate you could taste. Intense flavours, without the cloying sweetness and fat that you get in many handmade chocolates characterise their products. Why are they so different? First of all they use unroasted organic raw cocoa beans in making their chocolates. So what is so good about that? Well according to the guys, this means that the good nutrients and enzymes in the cocoa are not destroyed. The result is a product is a product that is rich in anti oxidants and contains no sugar or dairy products. The cocoa has one of the highest levels of antioxidants and is rich in magnesium. Using unheated organic cocoa means that this chocolate retains its healthy attributes. Their cocoa comes from ethically managed farms in Ecuador and it’s organic, GM and pesticide free. BUT our favorite chocolatier is still Nontwenhle Mchunu who is a good friend and a self-confessed chocoholic. 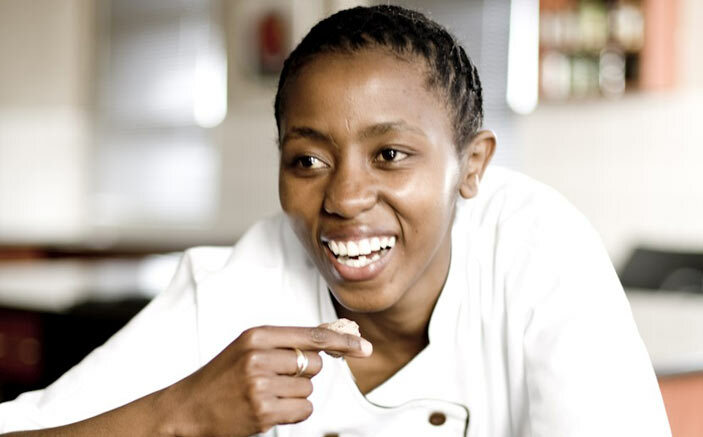 Nontwenhle is perfectly poised to build her African premium brand, eZulwini Chocolat. eZulwini means “heaven” in isiZulu. eZulwini is also Prince Dabulamanzi ka Mpande’s Royal House, and Nontwenhle is a descendent. The Royal House of Ezulwini pioneered Zulu resistance to British colonization and resistance to Nontwenhle’s chocolates is futile. She is a graduate of the Raymond Ackerman Academy of Entrepreneurial Development and she has trained in the UK and Switzerland. Keep a lookout for a chocolate inspired food and wine weekend with Nontwenhle at Augusta de Mist as soon as we have set a date!